Prana - 'life force' in sanskrit is a destination where travellers around the world come for rejuvenating their vitality and life energies. Located at 7000 feet altitude in Kodaikanal, a small romantic town atop the misty mountains, the climate is ideal for revitalizing energies with clean air, lush fauna and flora. Website: www.thepranaspa.com Email thepranaspa@gmail.com to make an appointment. Kodaikanal Health and Medical Services, a multi-speciality hospital equipped with patient rooms, beds and operation theaters is the best hospital in kodaikanal. It is located in Lawsghat Rd, near Bharat Gas Agency. Van Allen Hospital is located next to Coaker's Walk. In April 1915, Dr.Van Allen raised funds to construct the first unit of the hospital at the entrance of Coaker's walk.So it was named after him. Facilities got updated from time to time and now it has X-ray machine, well equipped pathological lab, and operation theatre with blood transfusion facilities. 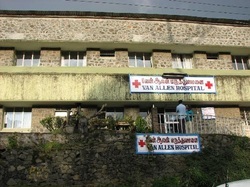 This is another hospital in kodaikanal. It is situated on the hillside near Rock cottage on lower shola road. It was a small municipal hospital until 1927. Now it has X-ray, Dental, Maternity ward and other facilities. The state Government's animal husbandry department maintains this hospital in Munjikal. There is a mobile unit which cater needs of nearby villages. It also offers extension work in dairy improvement and poultry farming.